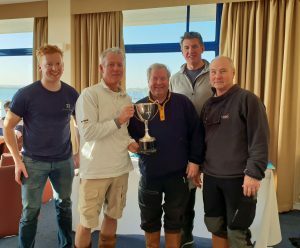 The Burnham Dragon Fleet ended their season in style with eleven boats slipping their moorings for Saturday afternoon racing – the first of two races to decide the Peter Matthews Memorial Trophy. With a weak flood tide and Easterly breeze, the fleet used the width of the river on the beat, with ‘Quicksilver VI’ (Rob, Can, Nick) just edging ‘Anarchy’ (Chip, Nicola, Rob) to Ron Pipe for the first of three visits. Running to Wallaseaness twice, the fleet continued to compete for position with the top five establishing a small gap to the remainder of the fleet. ‘Pageboy XI’ (Paul, Clive, Graeme) took the win from ‘Scorpio’ (Ian, Rene, Alex). 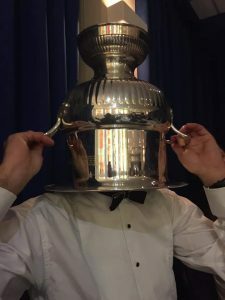 Noddy, summarised the 2018 season, his first as Fleet Captain, before issuing thanks to all those who contributed to the season, then handing out the silverware – trophy winners listed in full below. Nicola Hastwell won the Crew Race, Harriet won the crew nomination and the Hectic Seal was presented to Coral Trantor to whom we are grateful for posting race results for the RCYC for the last eight years. The star raffle prize, a Zhik jacket sponsored by Andy Ramsey at Yachting Solutions, was won by Rob Campbell. 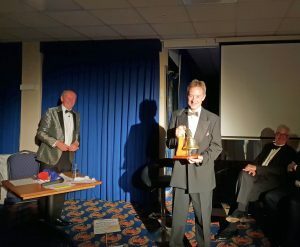 Andy Moss and Leigh Turvey presented the Clanger trophy this year with much hilarity. Tables split into ten teams and were initially tasked with crafting a boating scene ‘Blue Peter’ style, before compere Andy Moss, selected four anxious contestants to take part in a heavily doctored edition of Mastermind, with specialist subjects selected to reflect each contestant’s clanger-worthy antics from the season. To say bookies favourite, Chip Cole, looked nervous was an understatement as we were reminded of his attempted finish on lap three of a four lap race. Outsider David Brown came in with a late nomination, and scooped up the least wanted award of the evening for questionable navigation towing his Dragon up a mountain in France. ‘Scorpio’ sailed into the lead on the first run to Wallaseaness but excellent work from ‘Beauty and the Beast’ (Peter, Katie, Mark) saw them earn ‘room’ at Wallaseaness the second time around and they took up the lead and held it to the finish. ‘Pageboy XI’ took the runner up spot and with that, the Peter Matthews Memorial Trophy presented in the bar by Peter’s son Charlie Matthews who had been racing on ‘Dax’ with Smithy and Harry.